This sculptural group originally stood over the entrance to the choir or altar area of a church, supported by a massive, wooden (rood) beam or screen. Thus, the group would have occupied the center of the nave and faced the congregation. The central image of the suffering Jesus relates to the saying of Mass at the altar, the Christian rite that celebrates Jesus' sacrifice for the salvation of mankind. 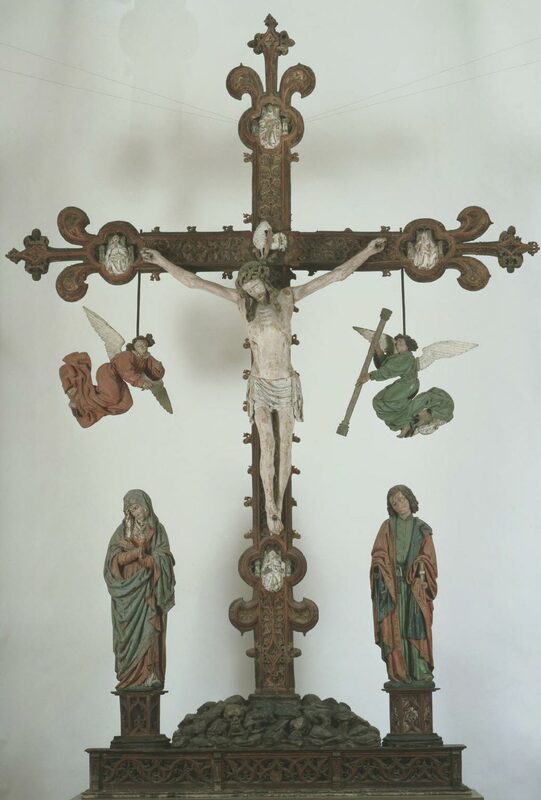 When acquired by George Grey Barnard in 1925, this Crucifixion group was said to come from Oignies, a town in southern Belgium, a provenance that remains unconfirmed. Once such sculptures were common in Flemish churches, but many were destroyed in the Reformation in the sixteenth century, and this is the only example in a museum in the United States. Originally, the dramatic group would have been supported by a strong beam or screen, and stood above the entrance to a church choir with the main altar beyond. The scene of the crucifixion of Christ is directly related to the ceremony of the Mass that would have been said below. Emphasizing the centrality of the event to church doctrine are depictions of the Latin fathers of the church at the corners of the cross (clockwise: Saints Gregory the Great, Jerome, Ambrose, and Augustine). In the Museum, the group stands at the entrance to the medieval galleries in a navelike space that echoes its original placement. Dean Walker, from Philadelphia Museum of Art: Handbook of the Collections (1995), p. 112.